TCC & Workshop at Kitchener festival. The Crypt Club was invited to help kick off the inaugural 10.22 Media Short Horror Film Festival in Kitchener, ON. As if that weren't honour enough, Festival Director Eddy Velasquez [top photo, on left] asked if I could present a workshop for indie filmmakers based on my years of filmmaking experience which spans indie, studio, and network productions. How could I refuse? Especially since my friend Marc Lougee [bottom photo, on right] would also be presenting an animation workshop based on creating The Pit and the Pendulum. The weekend was a hoot. We videotaped the resulting info-laden, tip-crammed 2 hour workshop, entitled Indie Production Planning: Getting Your Day. With a little time and fancy editing the workshop will be soon be available in book and DVD formats. Toronto Zombie Walk article on K-W. Sometimes you have to go undercover to get the real dirt on a story. 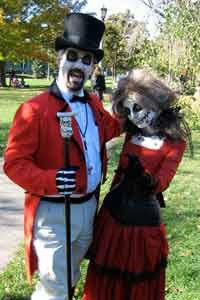 This time I donned whiteface and a red riding coat to become a zombie ring master. That's me in the photo with TZW founder Thea Munster - before the carnage began. You don't really lead a herd of more than 1,000 undead. You just get in front of them and stay out of their way. Lots of surprised looks from Toronto residents as a tidal wave of zombies swarmed the streets en route to the Bloor Cinema for a special zombie screening. This year Toronto. Tomorrow... the world! It was a week of dark chills and thrills as the second Toronto After Dark Film Festival swept the city. I was at many of the screenings and events to wave the AAAAAH!! Indie Horror Hits banner. Our ad in the festival program drew enquiries from fans and filmmakers alike. Seems a lot of folks just cannot get enough horror in their diet. The TAD festival's films came from around the world and showcased a diversity of horror genre visions. 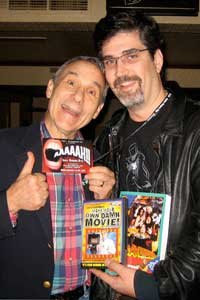 And then there's the chance to meet Troma Films' head honcho Lloyd Kaufman for a chin wag, and a thumbs up photo op. [bottom photo, on left] His film Poultrygeist: Night of the Chicken Dead is a crowd pleaser with a message (don't tell anyone) and a catchy theme song. TCC Wins Tabloid Witch Award. 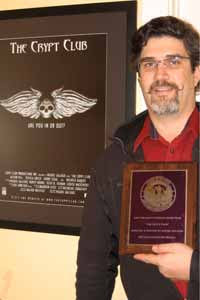 The Hollywood Investigator's managing editor Thomas M. Sipos announced the winners of the 2007 Tabloid Witch Awards, including my own The Crypt Club as Best Dramatic Short Horror Film. Sipos hailed the film as "a welcome return to classic, ghostly horror. A morality tale set in a creepy cemetery on a snowy night." This year's Hollywood-based festival demonstrated the worldwide appreciation of horror films with winning entries from England, New Zealand, Argentina, Canada, and the USA. This is the 18th award for The Crypt Club, which is an official selection of over 45 international film festivals. This award places The Crypt Club in some pretty good company as Mike Flanagan's Oculus and Christopher Alan Broadstone's Human No More are both past Tabloid Witch Award winners and AAAAAH!! Indie Horror Hits participating films. The premiere screening of this year's award winning films will be at the Santa Monica Public Library on October 27, 2007, from 10 a.m. to 5:30 p.m. The screening is free and open to the public on a first come first seated basis. There will be a filmmaker Q&A. Carnival Diablo article on K-W.
On September 15, I was at the 15th Anniversary performance of Carnival Diablo at the Rose Theatre in Brampton, Ontario. I'd heard about this show for years, but was never in the right place at the right time to attend one of their macabre performances. Finally, we coincided. And I was pleasantly surprised that a dear friend of The Crypt Club - Hearsella's mom, Thea - is now part of the Carnival Diablo troupe. Small (twisted) world, indeed. I wrote my thoughts on the performance and the state of the disappearing carnival sideshow for the latest Killer-Works newsletter. Enjoy, and remember to tip your server generously.